Alan Bennett was joined on the Hay stage by Nicholas Hytner, known for his work in the National Theatre, to preview and discuss their new film ‘The Lady in the Van’. The story is based on Alan’s memoirs of his relationship with Mrs. Shepherd, a homeless lady who lived in a van, moved onto his drive for three months and ended up staying there for 15 years. The memoirs became a successful play starring Maggie Smith and once again, she takes the lead in the film production. The audience was treated to several clips of the film and judging by the roars of laughter, I think that anyone who goes to the cinema to see this film will not be disappointed. The film script was written once Maggie Smith agreed to take part in the film and she appears to embrace the role so wholeheartedly that you forget she is an actress playing a role. 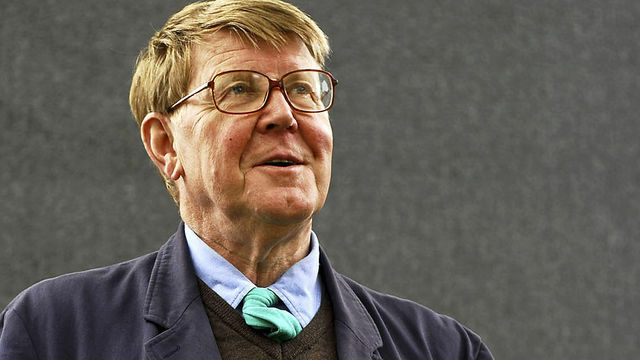 The film is narrated from two viewpoints of Alan Bennett, as the man who offers compassion to the woman and as the writer who observes and records the story. The presentation was filled with humorous moments as both Alan Bennett and Nicholas Hytner described the reactions of the neighbours in the street of Camden where they filmed, how layers of filth were created, a weekend when two homeless men took up residency in the ‘prop’ van so that it had to be sanitized and refilled with sterile filth, and the determination of Mrs. Shepherd to form her own political party. However, the main message of the evening was about humanity. Mr. Bennett observed this poor homeless woman being tormented on the street and that interfered with his creativity as a writer and so, he issued that invitation to move onto his drive. When he speaks about her, Alan Bennett uses words of respect and he was able to see beyond the dirty clothes and offensive smells. I discussed this presentation with a woman in the queue at the bookshop and she echoed my description of the sense of humanity that marked the presentation. At the end of the hour Alan Bennett was presented with the Hay Festival Medal for Drama and the audience rose to their feet. He responded with a humorous story and left me wishing that the man who is Alan Bennett was a friend of mine.